Lake Mead National Recreation Area is a startling contrast of desert and water, mountains and canyons, primitive backcountry and modern technology. Two powerful and uncompromising forces created this fantastic place. Nature, working slowly over millions of years, built the foundation. Humans have worked feverishly over the last century to remodel and build a landscape that better suited their modern needs and desires. These efforts created two lakes in one of the hottest, driest regions on Earth. 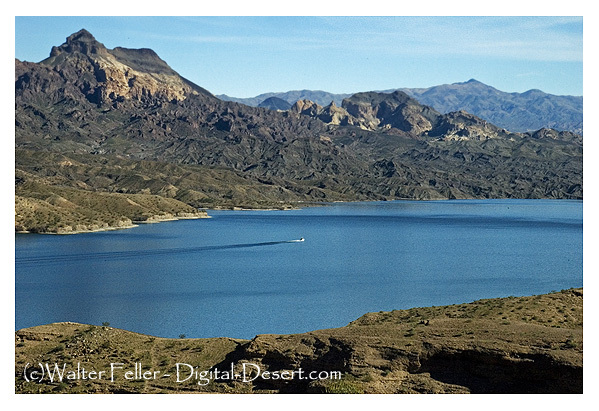 Lake Mead and Lake Mohave emerged as the center of the country's first national recreation area. People flocked to the desert for boating, fishing, swimming and wateskiing. Today, thousands of visitors enjoy the cool, refreshing lakes. Attracted at first by the water, visitors find other unexpected rewards. There is the quiet and stark beauty of the desert. There are imposing scenes of the ancient, twisted mountains of the Basin and Range province and the colorful vertical walls and high plateaus of the Grand Canyon. There is unspoiled backcountry, and there is Hoover Dam - a towering symbol of what human genius can achieve. The range of experiences is as broad as the lakes and as big as the land.